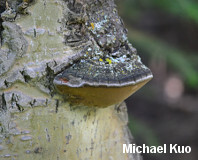 Phellinus tremulae is found wherever aspen trees occur; it is a parasitic fungus that causes decay of aspen heartwood. 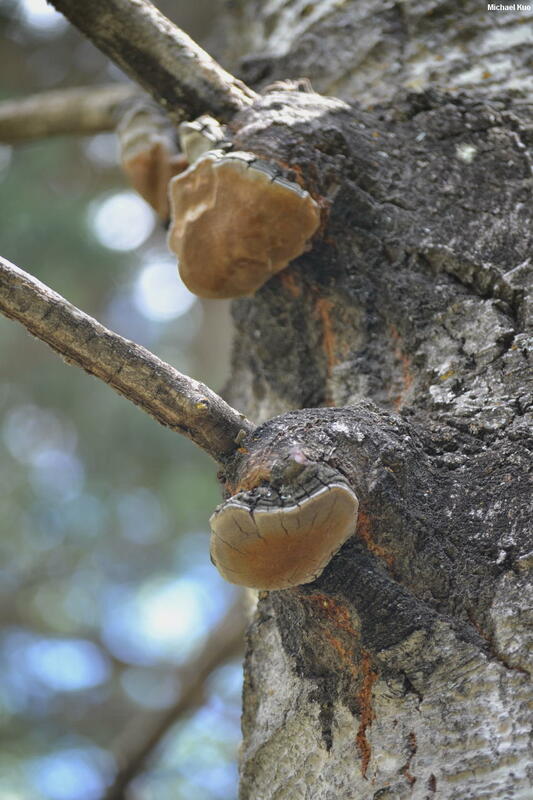 The fruiting bodies are tough and woody--and since they are perennial, they develop a new tube layer each year and grow until they are cracked, blackened, and covered with lichens. 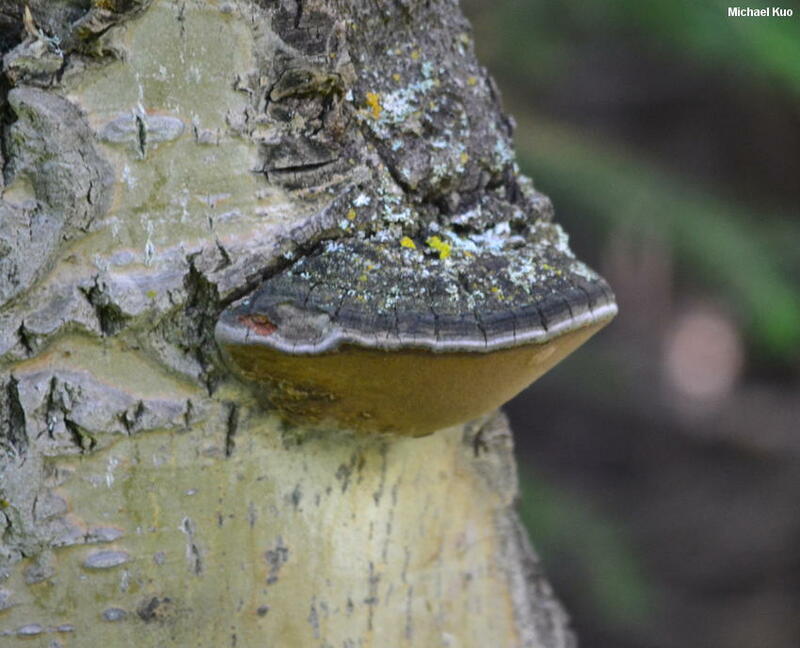 Phellinus tremulae usually appears in the distinctive, eye-shaped branch scars that are typical of aspens, and the mushroom causes the tree's wood to swell, resulting in a distinctive, sloping upper surface. Recent studies demonstrate that Phellinus tremulae is crucial for gnats in the genus Sciophila (Bouchard & Bouchard-Madrelle, 2005 & 2010), and that the gnats may assist the fungus in spore dispersal. Additional studies demonstrate the importance of Phellinus tremulae for yellow-bellied sapsuckers (Savignac & Machtans, 2006) and red-naped sapsuckers (Losin and collaborators, 2006), which use aspens infected by the fungus as nesting sites. 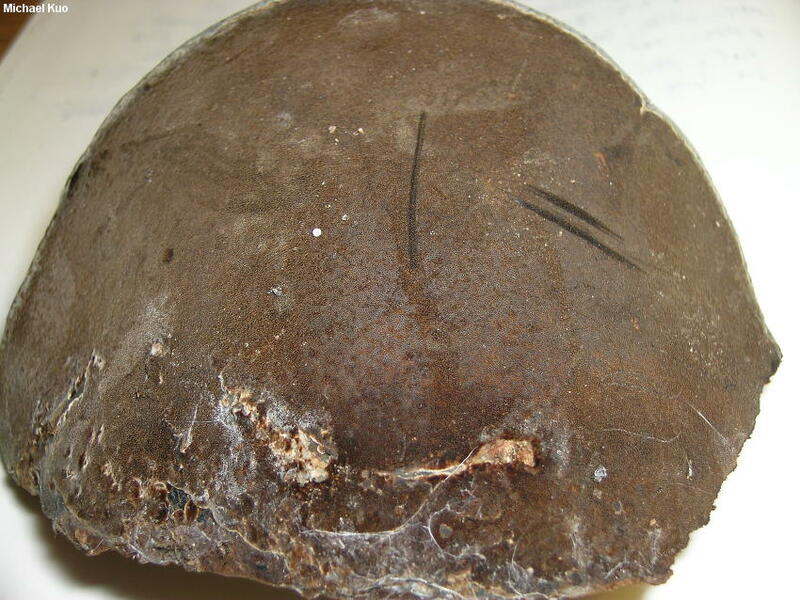 Although Wagner & Fischer (2002) found the traditional genera Phellinus and Inonotus to be the mycological equivalent of a hot mess, Phellinus tremulae was found to be closely related to Phellinus igniarius, the type species of the genus Phellinus, and therefore remains in the genus. A subsequent study (Fischer & Binder, 2004) compared North American collections of Phellinus tremulae to European and Asian collections, and found that "the phylogenetic data . . . suggest the existence of two separate taxa." Since the species was originally named from Europe ("tremulae" for association with the Eurasian aspen, Populus tremula), the North American version described and illustrated here may wind up with a new name in the near future. Ecology: Parasitic on the heartwood of quaking aspen, big-toothed aspen and, in Europe and Asia, trembling aspen; causing a whitish to yellowish rot; growing alone or gregariously from wounds and branch scars; perennial; widely distributed in North America where aspens occur. The illustrated and described collections are from Colorado. 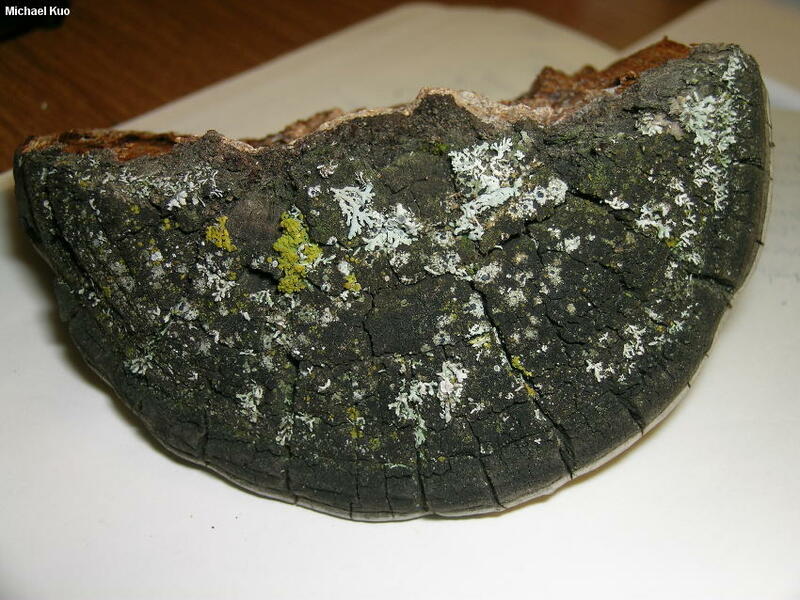 Cap: Convex and semicircular or fan-shaped at first, becoming hoof-shaped with age; 5-20 cm across; usually sloping away from a swollen spot on the tree, making it difficult to determine where the tree stops and the fungus begins; finely hairy to bald, becoming very rugged, and radially cracked; brown to dark grayish brown or blackish; paler and smoother along the margin; usually at least faintly zoned with distinct annual layers; often becoming covered with algae, moss, and/or lichens. 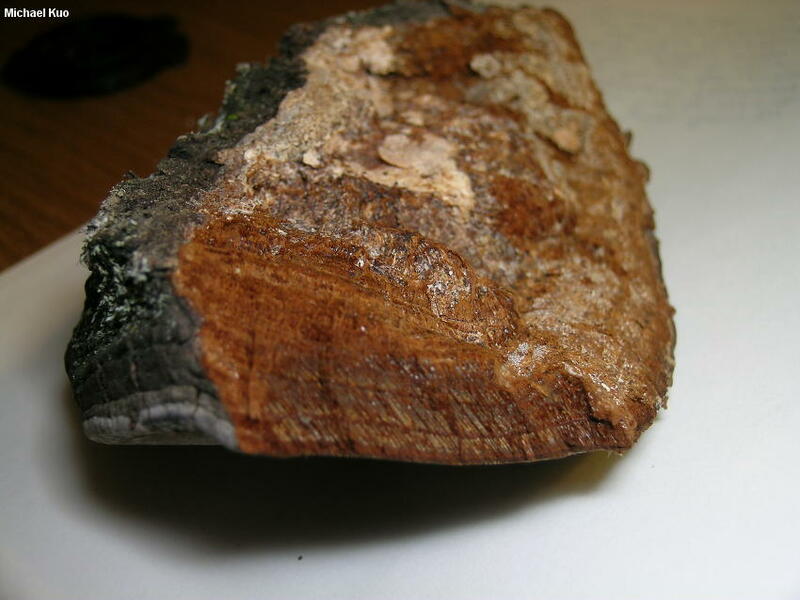 Pore Surface: Dark tawny brown to yellowish brown or purplish brown; when fresh bruising darker brown; appearing velvety; with 3-5 round to slightly angular pores per mm; tube layers fairly distinct, or occasionally vague and difficult to determine, up to about 4 mm deep, with whitish flecks and material scattered between the tubes and tube layers. Flesh: Reddish brown; tough and woody. 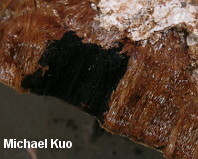 Chemical Reactions: KOH instantly black on flesh and tubes. 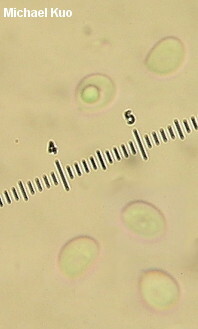 Microscopic Features: Spores 4-5.5 x 4-4.5 µ; broadly ellipsoid to subglobose; smooth; developing thick walls; hyaline to yellowish in KOH. Setae thick-walled; dark brown in KOH; to about 25 x 10 µ; fusiform. Hyphal system dimitic; generative hyphae thin-walled and hyaline; skeletal hyphae thick-walled and dark reddish brown. REFERENCES: (Bondartasev, 1935) Bondartsev & P. N. Borisov, 1953. (Breitenbach & Kränzlin, 1986; Gilbertson & Ryvarden, 1987; States, 1990; Wagner & Fischer, 2002; Fischer & Binder, 2004; McNeil, 2006; Evenson, 2015.) Herb. Kuo 08201207, 07241301, 08161402. Herb. DBG ROMO 2012-5024-17. Phellinus tremulae at Tom Volk's Fungi.